Tonight I finished a few more bases of my Macedonians. Finished another base of Phalangites and Hypaspists (both are Foundry miniatures) and a base of Scythian horse archers. The Scythians are from Vendel and are really nice sculpts, I probably didn't do them justice. The Scythians were the only thing I needed to complete an Imperial Alexander BI army. Not sure what I'm going to do next, I think I'll either do a unit of light cav and more Phalangites or maybe some Persian skirmishers for the Antigonos and Demetrios list. Or maybe I'll do my pair of Dumbos. We'll see. Last Tuesday's game of AWI Battle of Saratoga made me think what my long term plans are. I'm eventually looking to do some 6mm but I'm not sure what period to do. The AWI game really peaked my interest and I'm kind of leaning in this direction. Anything 20th century doesn't appeal, Napoleonics are just intimidating, Medieval doesn't really float my boat and Ancients is probably the only other period that would interest me. Hmm, not sure. Finished another base of Phalangites, a base of Thessalian medium cavalry and a general piece. The Phalangites and the general are Foundry and the Thessalians are A&A. Next up is a unit of Scythian horse archers, a unit of Hypaspists and another unit of Phalangites. 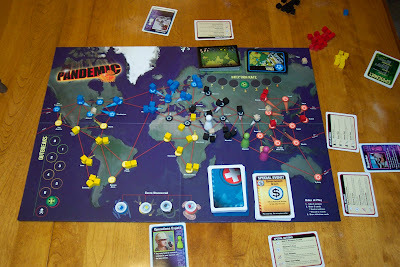 A few days ago I was over at a friends place and we played a few games of Pandemic. In this game the players cooperate against the game. Out of the 5 games we played, we only managed to win twice. A fun and easy game to play but not easy to win. Tonight I finally completed 4 base of Greek/Macedonian/Successor skirmishers tonight (finally!). Last night I had some friends over and played a game of Britannia. Can't say I really enjoyed it that much. Unless you're on a turn where you've got a lot of troops and roll over everybody, it's rather boring. There's long periods where you can do a lot of nothing. One of the players ended up getting pinned in northern Scotland and in Wales and really couldn't do anything for a sizable chunk of the game. Congrats to Shane on winning. I also got in a couple games of Twilight Struggle. I love this game and can't get enough. Next up on the paint table is a base of Phalangites, a base of medium cavalry and a foot general. So yesterday Dave and I had our 4th battle in our Dark Ages campaign. Here's the initial setup. Due to the large terrain, I went in thinking I was going to get bogged down by small skirmishing units. Thankfully that wasn't the case and I was finally able to pull off a win. I think my maneuverability helped coupled with the large amount of forested terrain. That and the fact some of the Scottish lads decided to run down some crossbowmen thereby pulling their most powerful unit out of line and pretty much out of the main fight. Once again my Pueri let me down, beaten by some foot skirmishers. And those damnable Vikings. Argh! Four hits against my heavy cavalry with 3+ armour save. The result: 3 dead Milites and panic ensues. I swear those Vikings are worth their weight in gold. The next battle (and I believe this is our final battle) will be the Battle on the River Dubglas. 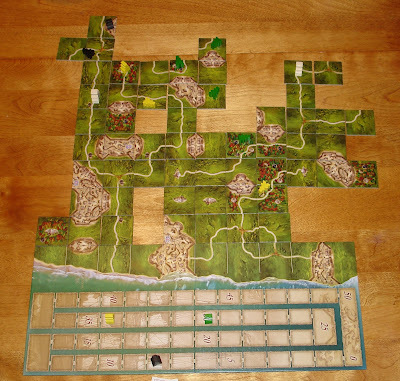 On the weekend I played a couple games of Carcassonne: New World. A pic or two should be forthcoming. This weekend coming up I have another game of Twilight Struggle and a game of Britannia by Fantasy Flight Games. edit: here's the pic from the Carcassonne: New World game I played.